All children are measured, recursively through the hierarchy, calling their implementations of Measure, MeasureCore, MeasureOverride. All children are arranged in the Arrange, ArrangeCore, and ArrangeOverride methods. In case the size returned by the ArrangeOverride method differs from the size it was invoked with, the Measure stage is invoked again, due to the change in the size required for layout. The measure stage is followed by a second call to Arrange, which arranges the children taking into account the new measures of the children. The measure stage calculates the RadElement DesiredSize property. DesiredSize is the minimum size that ensures that element content will not be clipped. By default FillPrimitive can be drawn without clipping even with empty size. DesiredSize for FillPrimitive is (0, 0) by default. The DesiredSize for a HostItem (and indirectly for RadTextBoxElement) is determined by the size of the hosted control. By default the DesiredSize of a RadTextBoxElement is determined by the default size of the hosted TextBox. The DesiredSize of RadLabel is determined by the Font and the Text property. The measure stage recurses over the element hierarchy calling three functions: Measure, MeasureCore and MeasureOverride. An element's Measure method calls MeasureCore, which in turn calls MeasureOverride. MeasureOverride calls the Measure method of all element children. The Measure function manages the progression of states in the layout mechanism, e.g. adding and removing the element from the "measure queue". Transform the size parameter passed to MeasureOverride so that Margins, Scale and AngleTransform are taken into account. The meaning of this parameter is "the size provided by the parent in which the desired size must fit". Transform the MeasureOverride return value, again taking Margins, Scale and AngleTransform into account. To the DesiredSize is assigned the result of this transformation. Padding is handled differently for each custom layout and so is not considered in the base MeasureCore method. Padding should be handled in the MeasureOverride method. This method receives a parameter containing the size available for its children after transformations are applied (margin, rotation, scaling). MeasureOverride returns the minimum size of the area in which all child elements can be positioned according to their DesiredSizes and any other logic implemented. The default implementation returns the maximum dimension values of the child elements. 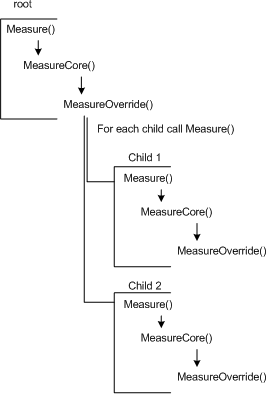 MeasureOverride should call the Measure method for any children. The Measure method takes a single SizeF "availableSize" parameter. To the DesiredSize is assigned the availableSize or the MeasureOverride return value, whichever is less. 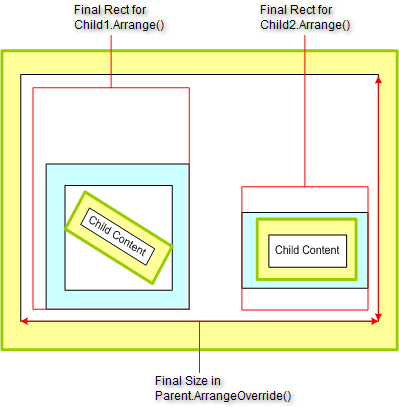 The diagram below shows how the size available to children is determined after applying margin, padding and rotation transformations to the size available for the parent element. After the measuring stage of the layout process completes, the arrange stage is invoked to position child elements within the allocated area. The arrange stage calculates the size available to children, taking into account margins, transformations, alignment and stretching. The process is analogous to the measure stage. The methods are Arrange, ArrangeCore and ArrangeOverride. This method receives a parameter containing the available size for children to be arranged in. Child elements must have their Arrange method called to have their bounds set. 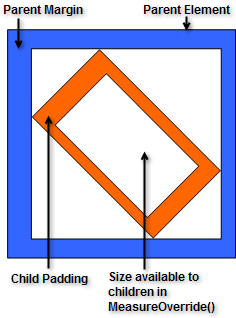 The rectangle that is fed to each child Arrange call is the area where the child can position itself. The child can be stretched within the available area or aligned within the area using the Alignment property. The DesiredSize of every child is valid in the parent's ArrangeOverride() method and may be used in the calculations. The rectangles allocated by ArrangeOverride do not need to be next to each other or ordered in any particular fashion. The example below shows a scenario where children are arranged with a size greater then their desired size. The first child is aligned in the bottom-right corner of the size it has received for layout, while the second child is stretched horizontally and aligned in the center. The ArrangeOverride and MeasureOverride implementations in the layout panel logic are to be used for reserving size and arranging elements within the available area. They are not meant to be used for setting layout properties, but rather for implementing the logic needed to achieve the desired visual appearance. Layout-affecting properties such as Margin, Scale and Padding are meant to be set outside of the layout panel logic code. There are two static queues for the two layout stages: MeasureQueue and ArrangeQueue. The layout consists of two cycles that loop through the elements in the queues. The first cycle is the measure cycle which loops over the measure queue and exits when the measure queue is empty. The second cycle loops over the arrange queue and exits when the arrange queue is empty. During these two cycles, elements can be added to the two queues. There is a cycle that encloses the two aforementioned cycles, which runs until the two queues are empty. The measure cycle calls its Measure method for each element in the measure queue. The Measure method deletes the element from the queue if the Measure stage is finished for the element. The arrange cycle calls the Arrange method of each element in the arrange queue in a similar way. Each time the measure or arrange stage of an element is invalidated, the element is added to the appropriate layout queue. Then the layout cycle enclosing the measure and arrange loops is called asynchronously.